Brush Up On Your Bartending Skills – Inspiration from Las Vegas’ Best Flair Bartenders – TAM Card® Nation in Vegas! There are a lot of things that go into a great bartender: a winning personality, an attention to detail, and a dedication to the legal and moral responsibilities that come with serving alcoholic beverages. Think you might be right for the job? Why not get a leg up on the competition with additional skills and techniques to set you apart from the competition? If you can flip bottles, juggle cocktail shakers, and serve up excellent drinks with a smile, you may be a great candidate for becoming a flair bartender. Additionally, flair bartenders can do pretty well for themselves, especially if they can entertain while serving. Flair bartenders will draw in more customers, making more money for the bar, and themselves. 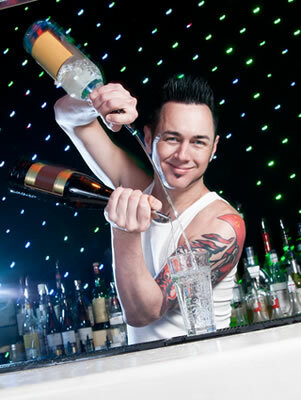 Flair bartenders are known for using bar tools and liquor bottles as props to entertain while they are mixing drinks. It can be quite a sight to see someone juggling liquor bottles, mixing drinks behind their backs, carefully setting fire to mixed drinks, and more. Las Vegas is home to some of the best flair bartenders in the country, and boasts several bars and clubs that showcase their talents. If you’re considering a career as a flair bartender, Las Vegas is the place to be. Make sure to check out Las Vegas Weekly’s article, “From glass-juggling to bottle-throwing, the best flair bars in Las Vegas,” for a feature on some of the city’s most impressive and popular flair bars. Obtain your TAM® Card. All hospitality professionals in Washoe and Clark Counties are required to obtain their alcohol education card prior to working at a location where they’ll be selling or serving alcoholic beverages. The Techniques of Alcohol Management® course will satisfy state training requirements and will give you the skills and knowledge you need to serve responsibly. Get educated on bartending techniques. Flair bartending requires a solid working knowledge of bartending skills, plus lots of practice, practice, practice! Before you start juggling liquor bottles, it’s important to learn how to mix drinks, and build up your bartending know-how of tips and techniques. It won’t matter how well you can entertain if you don’t know how to make a martini. Practice makes perfect. Every day at work you’ll have the chance to handle bottles and shakers, so practice spinning shakers in your hand and doing simple tricks when you have some downtime. Starting with the basics and working your way up to more difficult tricks, you’ll begin to feel comfortable with your props and impress your guests at the same time. You can also watch plenty of flair training videos online for tips and tricks to learning basic flair bartending moves. A great resource is TAM of Nevada’s YouTube channel; we’re always adding our favorite flair bartending videos and tutorials. Our most important advice of all of all: Remember to have fun! What is the best advice you would give to someone looking to start a career as a flair bartender? Previous Announcing Our Quarterly Customer Satisfaction Survey Winner – Have You Entered Our Drawing Yet?